Now that July 1 has passed, the magic date where coaches can start recruiting your kids for swimming, what happens next? It’s been two years since my daughter went through that hectic, exciting, fun summer. Looking back here’s a few things to think about during recruiting season. My experience is specific to the sport of swimming for my daughter. Although my son swam, he opted out of swimming in college. He doesn’t regret it at all. So, remember, swimming in college isn’t for every kid. But if your swimmer is interested, here are my thoughts about the process. Many of these ideas will apply to other sports, too. Make sure your swimmer replies to each call or email. 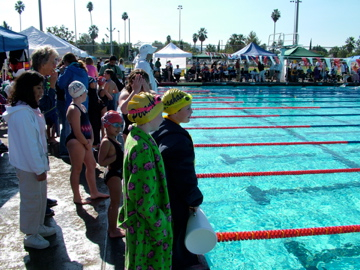 If your swimmer isn’t interested in a team, let the coach know quickly so he or she can focus energy on other swimmers. 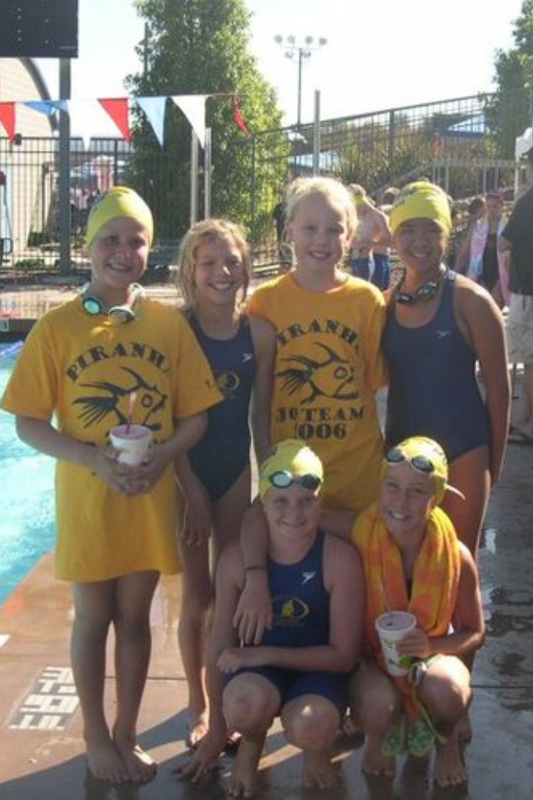 My daughter and teammates at JOs a while back. If your swimmer does not hear from their dream team or some of the teams they are interested in—what do you do? I would suggest to your swimmer to send an email and tell the coach they are interested. Ask what the walk on times are, or what they are looking for. Maybe your swimmer will figure out why they haven’t been contacted. Sometimes an email can get lost in the spam folder, or a coach may have overlooked your child. They may be happy to find out your swimmer is interested. 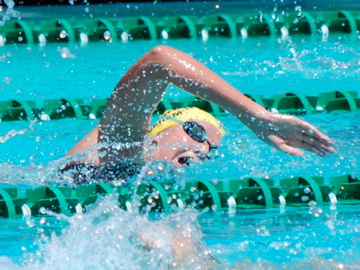 Your swimmer has nothing to lose by writing an email. I remember one of my daughter’s friends wanted to go to a certain PAC-12 school and she was so disappointed to not get an email or call from the team. After she did sign with a different PAC 12 university, she went through her spam folder and found an email from the coach of her dream school that she had not replied to! The good news is that she loves where she is and couldn’t be happier. During recruiting, my daughter made a list of teams that contacted her. In each conversation with coaches, she wrote down notes of things that were important to her. She wanted to swim outside. She wanted a team with men and women. She hadn’t decided on a major yet, so that wasn’t part of her criteria, but for many swimmers it will be. Each swimmer will have their own idea of what they’re looking for in a school and a team. Does your swimmer want to be a big fish in a small pond? Or do they want to be pushed by faster swimmers? Do they want to be at a major university? Or a smaller private school? Are they set on D1 or D2? Don’t overlook the many amazing schools in D3, NAIA and NJCAA. There are a lot of schools out there and swimming may open a door for your child to a school that would be more difficult to get into without their sport. 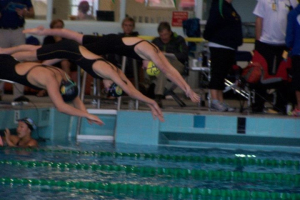 My kids have friends that were accepted to great universities–John Hopkins and NYU–as swimmers. They had the grades and SATs to get in on their own. But coaches can “flag” athletes. It may be the deciding factor between your child and thousands of other great students. 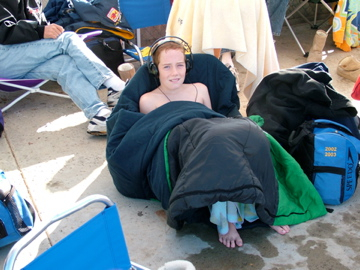 My son listening to music at a meet. There were a few schools I wanted my daughter to look at. I was so disappointed to hear my daughter tell the coach that no, she was afraid it wouldn’t be a good fit for her. But, remember, it’s your daughter or son’s college experience—not yours. After the summer, your swimmer will decide on where to go for recruit trips. In D1, if the rules haven’t changed, they get to select up to five schools. I’ve heard one coach say not to waste a school’s time or money if your swimmer knows they aren’t interested in a school. On the other hand, I’ve heard another coach say that it’s good to visit schools and get a feeling for the school. Your swimmer may fall in love with a program and school that they weren’t seriously considering before. It also comes down to time. How hard is it to travel five weekends in the fall and miss practice and perhaps school, too? The trips may all run together in your swimmer’s mind. You may want to limit the number of recruit trips to two or three of the top choices. That’s what my daughter did. The hard thing was when she came back and made her decision. She had to call the coaches of the schools she chose not to attend. The coaches were unbelievably gracious, professional and she would have been happy at any one of her top choices. That was a tough thing for her to do, but it was—as everything else about swimming—a learning experience and an opportunity to grow. It may come down to a difficult decision. 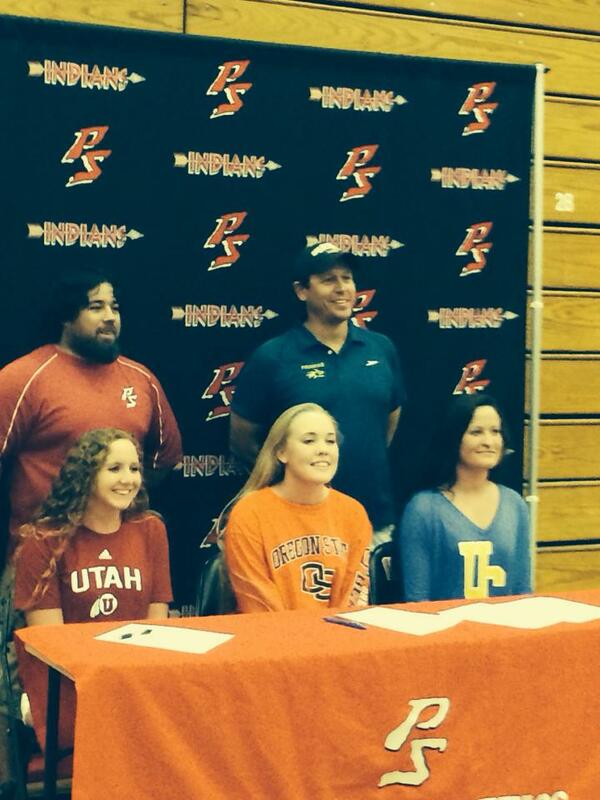 I remember one of my daughter’s club teammates choosing between USC, Berkeley, and Stanford. She couldn’t make a decision. I remember thinking—must be amazing to have such a choice! She waited until Spring to sign. So, remember that’s an option too. If your swimmer hasn’t found the right school by fall, there’s another window of opportunity in the spring. Waiting until Spring may limit choices or scholarships, because rosters might be filled. It worked for my daughter’s teammate, though. Wherever your swimmer ends up, be supportive. It’s an exciting time in your life and your swimmer’s. Be thankful they have this opportunity. My daughter liked her green fuzzy robe better than the team parka. This entry was posted in College Applications, college swimming, how to be recruited for college, Parenting, recrutiing, swim parents and tagged applying to college, college recruiting, college swimming, swim parents, swimming by bleuwater. Bookmark the permalink.